Mehen is an ancient Egyptian game, references to which have been found already in the predynastic period, before 3100 BCE. 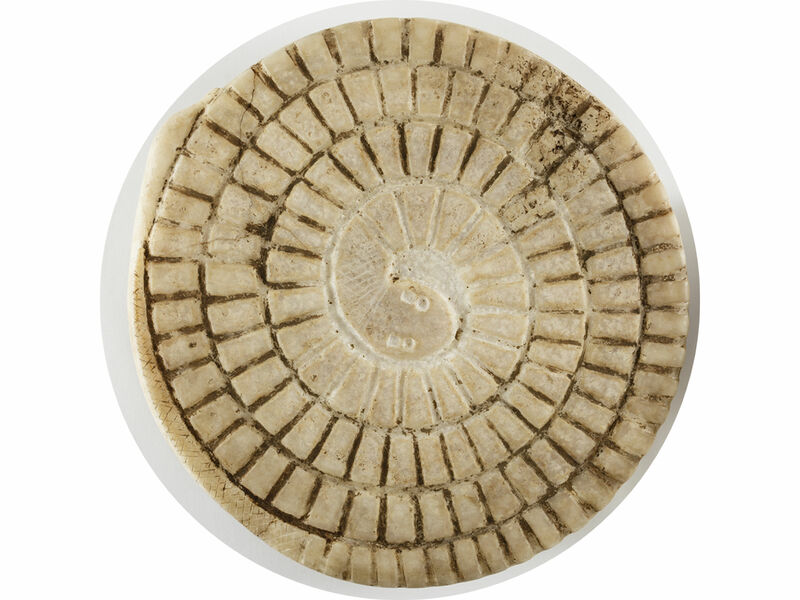 The game is a spiral in the shape of a coiled snake with the snake’s head in the center of the disk. The name Mehen, can refer to the spiral form of the game or its representation of the Egyptian snake-god Mehen. The game disappeared from use after the end of the Old Kingdom, about 2300 BCE. Besides Egypt, it is known that Mehen was also played in Cyprus and in Jordan, near the Dead Sea region, as examples of it were found at some sites there. Stone Mehen Game. 1st Dynasty, Egypt. British Museum, EA66852. Mehen was unique from other Egyptian games in the fact that it was a multi-player game that could have been played by up to six players. The original rules of the game are unknown. Examples of the game have been found together with six playing pieces in the shapes of dogs, hippos, and most commonly, lions, and with round balls, the use of which was unclear. The number of cells in the coil of the game board varied from as low as 40 to as high as 400. It seems that the number of cells did not affect the rules of the game. The complete set of Mehen is depicted on a drawing in the Mastaba of Hesy at Saqqara. 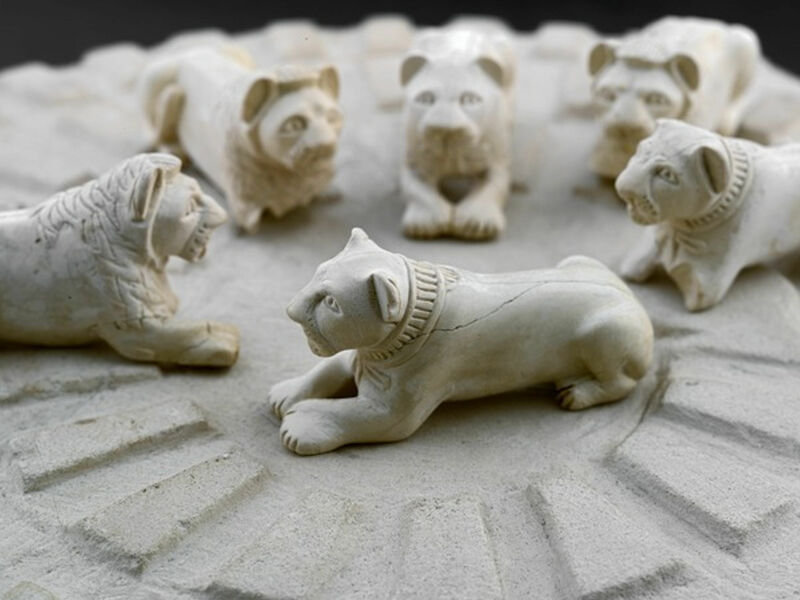 Six Ivory Mehen Lion Playing Pieces. 1st Dynasty, ca. 3100-2890 BCE. Egyptian Museum, Cairo. JE 44918 A-F, Ground Floor, Hall 43. From the archaeological record, it appears that Mehen fell out of use after the Old Kingdom, being taken over by Senet and Aseb. Although it should be noted that it did not completely vanish. 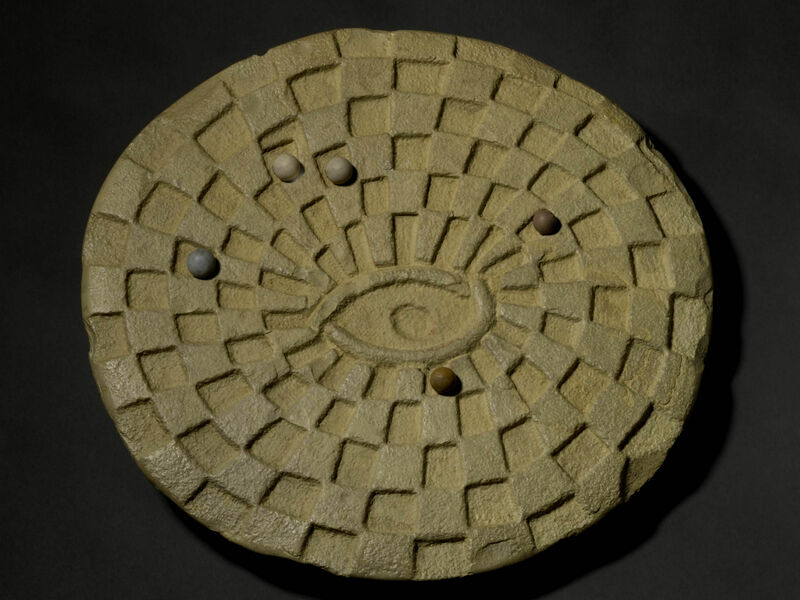 In 1925, Reginald Davies, a British Colonial Administrator in Sudan, recorded a game called Lib El Merafib, The Hyena Game, played by Kababish Arabs of Northern Sudan, in Nubia, which closely resembles Mehen, being played on a spiral board with all the pieces needing to reach the well in the center and then eaten by the hyena on their way back. I have presented here the best set of Mehen rules that I was able to find, which makes an interesting game, although simple, developed by Timothy Kendall and adapted by a Russian game re-constructor Dmitriy Skiryuk (Дмитрий Скирюк) and originally published on his blog in Russian. I have clarified some of unclear points in the rules to make them consistent. Number of players is 2 – 6. 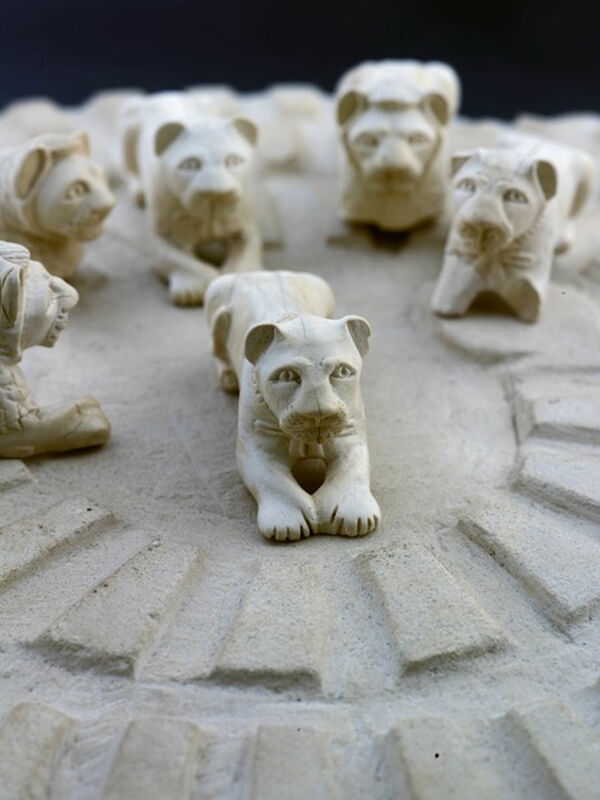 The game consists of a spiral board, 6 playing pieces in the shape of lions, 6 sets of 6 balls each, and 3 two sided, throwing sticks to serve as dice, with one side rounded and the other side flat. If one throwing stick landed on the flat side and the other two landed on the round side the score is 1. If two throwing sticks landed on the flat side and the last one landed on the round side the score is 2. If all three throwing sticks landed on the flat side the score is 3. If all three throwing sticks landed on the rounded side the score is 6, which is the maximum obtainable score. Scores 4 and 5 are skipped. The goal of the game is to first to obtain the lion piece and then use it to eat as many as possible balls. The pieces move from the outside (snake’s tail) in to the center (snake’s head) along the spiral, and then backwards to the outside (snake’s tail). Each player takes a turn after the other and turns cannot be repeated. All balls start off the board. Players move the balls one by one towards the center of the board. Once all the balls of a particular player make it into the center of board and then return to the beginning of the path at the tail that player gets a lion piece. The lion together with its balls starts moving back from the tail to the center and then back to the tail. On its way the lion tries to eat as many of opponents’ balls as possible. The lions move twice as fast as balls. Whatever the dice score is it is doubled for a lion. In order to place a ball on to the board the dice score must be 1. The balls continue to move along the path on the board with with dice scores 2, 3 and 6 only. If a player scores 1 then he “saves” that score for later. In order to enter the central cell the player score must be exact. Over scoring does not allow for the player to enter the central cell. If the player over-scores then they can subtract as many of saved ones as they have from the total score in order to achieve an exact score to enter the central cell. After the player enters the central cell in order to exit it on the way back the player must subtract 4 ones that they saved. If they don’t have enough ones then they must wait to throw the sticks each time it is their turn until they save 4 ones. Once the first ball of the player reaches the beginning of the path at the snake’s tail the player gets a lion. The lion starts moving towards the center and enters the central cell in the same way as regular balls. In order for the lion to exit the central cell he must subtract 10 saved ones in the same manner the balls must subtract 4 saved ones. On its way back the lion can eat opponent’s balls. When balls land on a cell occupied by an opponent’s ball the opponent’s ball gets knocked off. The knocked off ball switches places with the ball of the player that knocked it off, just like in Senet. The balls do not get taken off the board. When a lion lands onto a cell occupied by opponent’s ball, then it depends in which direction he is going. If he is going towards the center then the lion switches places with the ball, as a regular knock off. If the lion is going back to the tail and then he eats the ball and the ball gets removed from the board permanently. If the lion knocks off an opponent’s lion they swap places just like balls. Once the lions reaches the beginning of the board the game does not stop. Each player should bring all of their remaining balls back to the beginning of the path, to the tail of the snake, so that the other opponent’s lions do not get to eat them. The game ends when all lions reach the beginning of the path at the snake’s tail, even if some balls remain on the board. The winner is the player whose lion eats the most opponent’s balls, even if their lion reached the beginning of the path last. However, if all balls got eaten before any of the lions reached the snake’s tail then the lion who reaches the tail first wins. Each player needs to balance how many balls they bring on to the board. The less balls they have the less the opponent’s lions have to eat. Once the player’s ball gets eaten they can bring on another ball, but now that ball will take longer to get off the board. On the other hand, the more balls there are on the board, the more of a chance each player has to knock off their components pieces and delay the end of the game, thus allowing themselves to eat more balls. Crist, Walter, Anne-Elizabeth Dunn-Vaturi, and Alex de Voogt. Ancient Egyptians at Play: Board Games Across Borders. Bloomsbury Publishing, 2016. pp. 15-37. Kendall, Timothy. “Mehen: the ancient Egyptian game of the serpent.” Ancient Board Games in Perspective. British Museum Press, London (2007): 33-45. Davies, Reginald. “Some Arab games and puzzles.” Sudan Notes and Records 8 (1925): 145-146. Bell, R. C. Board and Table Games from Many Civilizations. Courier Corporation, 2012. pp. 12-14. I love your blog. I write historical fantasy set in a world based on the Hittites and I made up a game I called Sphinx and Griffin for the first book of the series (not in print yet, that being a slow process). I’m fascinated at the elaborate reconstructions of rules etc. Great job pulling all this together in such a clear and appealing way. By the oddest of coincidences and small worlds, I also live in Phoenix and you may have crossed paths with my husband at Intel (Robert Starkston), although he’s retired now. I sometimes think it would be fun to create a model and rules for my imaginary game–strategy not speed–but I have no mind for constructing the rules, so it’s intriguing to me that this is a joy to others. I used the game as a character development device in a courtship scene, between two very smart strategists, so I needed a pretty complicated game and I never worked out the actual playing of it. But it has a lovely ebony and ivory board and distinctive figurative pieces that move around on squares–all in my mind and the page only. Thanks for this great blog. I’ll share it with my readers. Hey Buddy!, I found this information for you: "Mehen". Here is the website link: https://www.ancientgames.org/mehen/. Thank you.